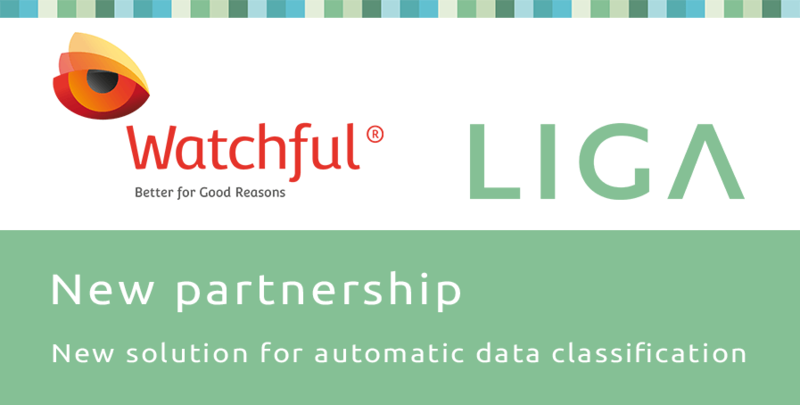 Lisbon, Portugal, 16 January 2017 – Watchful Software, a leading provider of data-centric classification solutions, has launched its first major channel partnership in the Nordic region in partnership with veteran Danish IT and security distributor Liga. The upcoming European Union General Data Protection Regulation (EU GDPR) will be a major focus of the new channel strategy for the region, helping companies in all sectors to get to grips with the strict new data management and security requirements coming into effect in 2018. Watchful’s RightsWATCH software is ideally designed for companies that need to get their digital houses in order, as it enables them to automatically implement security policies for data classification and labelling. Both legacy and newly created files are classified and labelled according to their level of sensitivity, encrypting all vital data against use by unauthorised users. Local partners are always important, but the Nordics in particular really need an experienced partner on the ground. The partnership with Liga will aim to provide a high level of value for resellers, with a focus on education and support geared around helping them meet the needs of companies in need of high level data classification suites ahead of the looming GDPR deadline. Watchful and Liga will begin by hosting a series of channel events throughout January to March 2017, including webinars and one day training courses to discuss best practice, use and customer cases, deployment methods and most importantly to share experience among the partners. Justine Cross, Regional Director at Watchful Software, comments: “The market demand in the Nordics was really highlighted when we attended a recent Internet Security Forum (ISF) event – Swedes were by far the most numerous nationality looking out for new security technology to address the GDPR. We’ve also already seen requests from some very prestigious companies in the region for classification solutions. “Local partners are always important, but the Nordics in particular really need an experienced partner on the ground. We actually partnered with Liga on recommendation from another vendor who saw what a good fit we would be, and their experience in the region will be invaluable as we focus on the region for the first time. Jens Nielsen, Sales Director at Liga, comments: “We have seen a huge increase in demand for solutions around areas like data classification that will help companies meet the GDPR requirements next year, so RightsWATCH is an ideal new addition to our offering. The Nordic region is a very mature market for IT and security, but many companies still need to overhaul the way they manage and secure data. The move from thinking of physical filing cabinets behind locked doors to data floating all around is not a fast one. Liga is an international IT trading company purchasing from global software vendors and selling these to Nordic customers. Liga likes to engage with IT resellers in all of the Nordic and Baltic region. Our technology focus is identity, mobility and security. The final end customers include all types of private companies to government as well as the education sector. Liga was formed in 1995. Headquartered is in Copenhagen, with an office in Stockholm. Watchful Software is a security company formed in 2012 to help businesses automate the process of keeping sensitive data safe from accidental or malicious loss or damage. Its flagship solution, RightsWATCH is designed to enable businesses to automatically implement security policies for data classification and labelling to meet compliance guidelines. It does this by being both intuitive and seamless for users and allowing security policies to be deployed in real time without intervention from either the IT support team or the user. The TypeWATCH technology is a behavioural biometrics solution which monitors a user’s unique keystroke pattern to identify anomalous behaviour and validate the user’s identity. Headquartered in New York, with European offices in Portugal and offices worldwide to service its many clients.